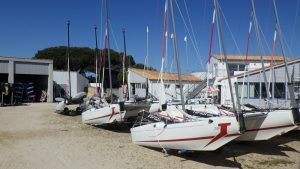 Located in the northern side of the Île de Ré, on a splendid body of water, the Nautical Club Portes en Ré was created in 1966. The sailing school welcomes you all year round and offers you access to many nautical activities, depending on your level. Our team of 10 qualified and experienced instructors (in high season), managed by the Director Youri Mosio and by Pierre Thieurmel, will guide you through your choice of the programme that suits you best: private lessons, rental or training courses! Also, Josselin Frigière recently joined our permanent team, providing you with boats and nautical gear at the Loge base. We wish to provide our members with up to date teaching methods and modern equipment, in a sporty and friendly way. Combining fun rides, team spirit and aquatic thrills, good times are awaiting you! Based on 3 locations: the Gros Jonc, the Loge and the Marais, the club owns 3 of the most beautiful boat sites on the island for teaching and practicing nautical activities. The association de loi 1901 (a non-profit organization) is run by volunteers since its creation (1966). The team thanks all the former members who contributed in the development of the club.